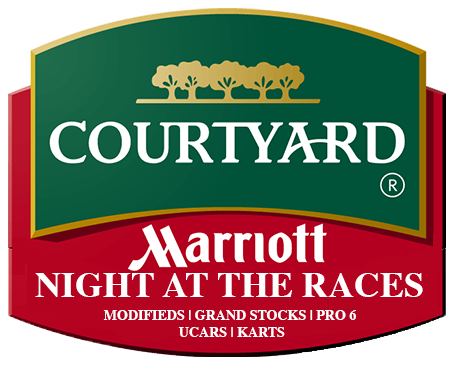 Hampton, VA – Everyone deserves a night off during their season, specially on the eve of Langley Speedways biggest race of the season, for some it will be the biggest race of their career. With the Late Model Stock cars having the night off we looked to Langley’s Modified division to provide our weekly fix of stock car racing! In a division that has shown a higher average car count though out the 2014 season saw 19 Modified’s take to the track for qualifying time trials. Robbie Babb would be your top qualifier for the evening meaning he would get the honors of leading the field to the green flag for race number one! Current points leader, who was at the time riding a four race win streak would line up to his outside with a time of 16.389! Rookie candidate Jon Largena, whom had been absent from the track the past three races returned and put his machine third on the grid (16.525), Rookie of the Year leader Taylor Sarkees lined up to his outside running a fast lap of (16.572), and finally rounding out the top five – a starting position not normal to this driver – was Jimmy Humblet with a fast time of (16.584). Green Flag waves on race number one with Robbie Babb leading the field into turn one. Balluzzo was not letting Babb get away without a fight as the two had just about a six car lead over Largena. An early caution on lap two for the three machines of McPherson, Gdovic and Sharkey who all spun in turn one! On the next restart Balluzzo & Humblet take the cone and start on the outside. Those top three clear the field easy into one with rookie Jon Largena behind them before a huge wreck down the back stretch. Chris Humblet got loose on the drive off of two, hit car went sliding through the grass and washing back up onto the track and cars went flying, quite literally! Kevin Adams got air borne after a huge hit into the rear of Chris Humblet’s machine. I was told the damage done to the front end of Adams ride caused the throttle to stick, sending him flying through the infield grass, banging through the turn three and four ditch. Safety crews quickly attended to Adams, removing him from his vehicle and transporting him to the hospital. Reports later that evening did confirm Adams broke his femur and would require surgery. 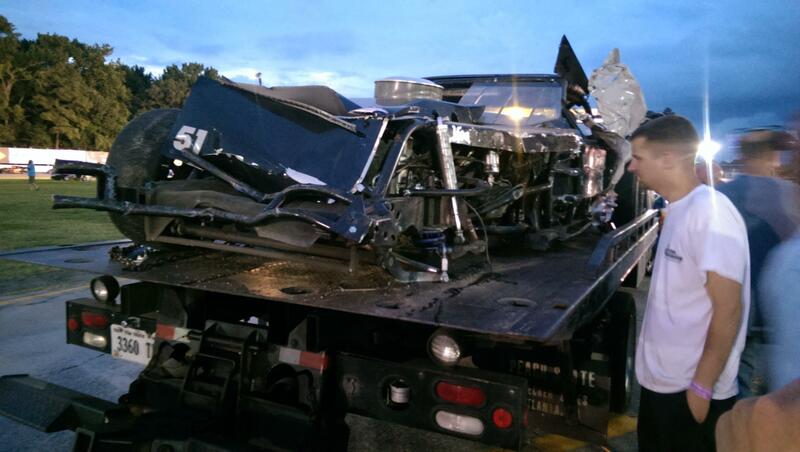 Image of Kevin Adams car after the wreck. Once we got going back to green flag racing the field did calm down and ran the next twenty-seven laps under green. Looked like Babb did his homework and take his first victory of the season leading flag to flag! “It was a long event. I hope everything’s good from that incident down there in Turn 3 and 4.” Babb expressed his concern for those involved in the incident mentioned above. “We’ve been a little off this season. We did a little bit of dirt-track racing, tried a little something different or whatever. Came back home. We’ve still got a little bit of work to do though.” Humblet took advantage of the cone lining up on the outside, making his move around Balluzzo and was able to hold onto that position finishing in the second position. Balluzzo would finish third on the evening with Danny Harrell and rookie Jon Largena rounding out the top five. The starting order for race two was an exact replica from the finishing order from the first race. The start of this race was rather interesting as the field was about to come to green Balluzzo pulled his machine down on the apron, team communication confirmed a minor issue with the steering column. Green flag was shown to the field and immediately the yellow. Balluzzo had to pull his machine down pit road to the attention of his crew, fixed the issue and rejoined at the rear of the field. Jon Largena also had to make an unexpected stop during that short caution. Spoke with the crew after the race and found out it was a radio issue that brought him down pit road. Largena said he could not hear spotter T.J Largena on the radio at all. Probably the better choice to get that fixed than drive blind with about sixteen other cars on the track. Both drivers knew exactly what they needed to do, turn up the wick and turn it up fast. As the field came back to green Balluzzo was like a bullet shot from a rifle, picking through cars left and right! Meanwhile, Babb & Humblet looked to go on a sunday drive! What these two men didn’t want to see were yellow flags, and we saw our fair share of them tonight. With the combination of the yellow flags and the cone rule these helped Balluzzo regain his track position! Going to work on the machine of Danny Harrell, Balluzzo was able to take the third position away by the halfway mark in the race. With another late race caution for the spin of #98 of Taylor Sarkees allowed for the field to get bunched up one more time. This allowed for Balluzzo to take the cone just one more time. With seven laps to go Balluzzo powered around Humblet on the restart, with one thing in mind… crossing that line first and adding another trophy to his collection. Balluzzo would make a very strong case for that goal, even trying to force Babb to over drive the corner. Just not enough laps were left to allow Balluzzo to make the pass cleanly and Babb would take home another victory. Humblet would finish the race scored in the third spot, Danny Harrell credited with the fourth spot. Wayne Hartley took home his best finish so far at Langley Speedway finishing out the top five. The Mods have the next weekend off as the annual Hampton Heat rolls into town, August 2nd will be the next time these guys return to action or a 50 lap feature! The first race on the docket for the evening were the Wing Champ Karts. Not even a quarter lap into the race Tyler Stallings goes for a ride in turn two which caused rookie Jesse Call to flip on his side. Vaughn Crittenden looked like he had an issue with a plug wire during that incident but was able to pull up to the safety crew in turn two, got his kart up and running again and rejoined the field. Two ladies brought the field to the green flag with Steele gaining the advantage. Amanda Frye trying to use the high line fell back quite a few spots before a caution flag “saved” her, well maybe it hurt her because she would eventually lose her clutch and had to pull off the speedway. On the next restart the top eight karts took off like they were shot out of a rocket! Did not take long for those drivers to get dicey, Steele, Jackson, Harberts and Lorah decided to take off. Lorah lost the draft a bit, Harberts falls back to pick him back up. Longer story a bit shorter, Jackson leaves Steele to pick up those two, rides around a few laps until Harberts & Lorah go around Jackson in turn three to take the checkered flag! Top five Finishers: Jake Harberts, Charlie-Ray Lorah, Tommy Jackson Jr, Angela-Marie Steele, Ryan Hudgins. 14 UCARS took the green flag with Justin Fuller & Courtney Shiflett your top two starters! Shiflett, always a quick car in practice and qualifying had issues again on the green flag! Looks like she missed a shift or something because she went from P2 to just about P11 in the blink of an eye. Only one caution on this race for the 0 car of Wheeler going for a ride through the turn three ditch. This brought out our favorite little guy, the Orange Cone! This allowed for Schaffer & Morgan to break into the top five and help keep them there for the race. Schaffer & Jones easily got the award for some of the best racing on the evening. The two used each others car as a rolling wall, trading paint and trading spots! Schaffer would be able to pilot his #3 car around Jones one last time to secure the runner up position. Top five Finishers: Justin Fuller, Eric Schaffer, Jesse Jones, Matt Morgan, Richard Ellis. Forty laps in the books for the Pepsi Grand Stocks and we have ourselves a new winner! Jamie Sample, who started P6 would use the cone to his advantage and brings home the hardware! This was the first win for Sample on the season as well as in the Grand Stock division. Tommy Sweeney with one hell of a run would hold on to finish second. Brandon Hinson who, throughout the race was in first, then back in what seemed to be sixth, and all over the track would be able to pilot his machine to a third place finish. Shawn Scovel probably with probably the biggest move of the night would go from tenth to fourth. Meanwhile points leader Mark Frye would bring his newly rebuilt chevy home fifth. Frye did finish ahead of Boyd – who in my opinion looked to be on pace to run into everything including the pace truck that night – so their championship position’s should stay somewhat the same. Speaking of Boyd he and Thomas Marks seemed to have it out for each other that night, this would eventually cause race director to park Thomas Marks, he was posted twice for aggressive driving and drawing a caution. I would also like to offer my opinion, and remember this is just my opinion, but Walker should have parked the #9 car of Boyd for his driving as well! Twelve Pro Six cars took to Langley Speedway with Bobby Hall taking home the checkered flag and extending his points lead. Landon Florian attempted his best to bring home the hardware after tearing his car up a few weeks ago, but had a tire go down that eventually brought out a caution. Through the virtue of the cone Florian was eventually able to bring his machine back to a top five finish! Cody Carlton attempted to to make it a great show, and a great show he delivered indeed just not enough car to being home the “W”. Nelson Moody & Casey Sipe with great runs tonight both finishing within the top five! An interesting little wreck with Dash McLaughlin & Debbie Biesecker as they tangled up under YELLOW FLAG conditions!